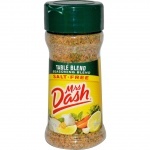 Mrs Dash Italian Medley Seasoning Blend 2oz Make your favorite pastas, pizzas, garlic breads and more with Mrs. 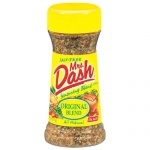 Dash Italian Medley Seasoning Blend. 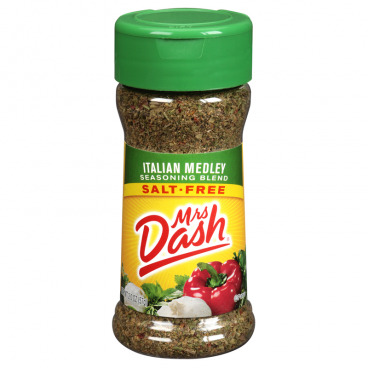 All natural and salt-free, robust blend of Italian herbs and spices like basil, oregano, rosemary, parsley and garlic Tansform your meals into true Italian feasts. Perfect for: Chicken, Pasta, Fish, Salads, Pizza, Garlic Bread. garlic, spices (basil, oregano, rosemary, parsley, marjoram, white pepper, sage, savory, cayenne pepper, thyme, bay, cumin, mustard, coriander), onion, red bell pepper, natural flavors, citric acid.